After Obama said extremism not limited to one religion, Cameron pointed out that world's biggest problem today is radicalized Islam. 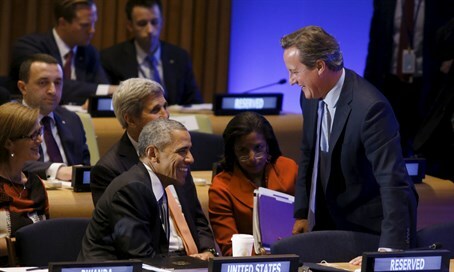 British Prime Minister David Cameron offered US President Barack Obama a pointed clarification after the latter told world leaders that violent extremism is not limited to any one religion. “Violent extremism is not unique to any one faith, so no one should ever be profiled or targeted simply because of their faith,” Obama said Tuesday at the United Nations Leaders’ Summit on Countering Islamic State and Violent Extremism. In response, Cameron asserted that violent extremism must be stopped at the root, which in today's world means radicalized Islam. “Barack, you are quite right, that every religion has its extremists, but we have to be frank that the biggest problem we have today is the Islamist extremist violence that has given birth to ISIL, to Al Shabaab to Al Nusra, Al Qaeda and so many other groups,” Cameron said. The British Prime Minister also demanded that Muslim leaders around the world speak out against extremist terror groups. ​“These people claim to act in the name of the Islamic religion. They don’t. I can say they don’t over and over again. You can say they don’t, but there is nothing more powerful than, for instance, what the king of Jordan has just said,” Cameron said, referencing King Abdullah's assertion that "Muslim nations have to lead this fight." Cameron also noted that the onus rested on Western countries to take a firm stance against the root of violence from making its way into Muslim immigrant communities. Obama, who has a good relationship with Cameron, did not appear ruffled by the British leader's assertion, calling his point "excellent." "Our focus should not be just violent extremism, but stopping the incubation of violence emerging out of an extreme worldview,” Obama noted.